Since I couldnâ€™t make up my mind which of the many telescopes Iâ€™ve been involved with over the last half-century was my favorite, Aurora agreed that I could write two articles: one on my past telescopes, and the other on my current telescope. Here is number one. I wasnâ€™t born in a telescope, but from our ranch in Yucaipa, California, we could see the morning sun glinting off the domes of both the 48- and 200-inch telescopes on Mt. Palomar. I spent a month every summer with my grandparents who lived at the foot of Mt. Wilson. We often picnicked on the observatory grounds near the 60- and 100-inch telescopes. My first scientific instrument was a microscopeâ€”a gift on my eighth birthday. Within hours I had removed the microscopeâ€™s eyepiece, borrowed my grandmotherâ€™s stamp-collecting magnifying glass, scrounged up a Quaker Oats box and, voila, my first telescope! The chromatic aberration was terrible but, along with the other neighborhood kids, I could see craters on the moon and even the moons of Jupiter. As a young teenager, I went one step further, buying a 3-inch objective lens from Jaegers which I assembled into a stovepipe telescope with a plumbing pipe mount. I soon discovered airplanes, rockets, and girls, however, and that was the end of telescopes until I was nearly forty (1979). My last semester of graduate school was a bit slow, so I decided to try my hand at some personally-funded scientific research. I chose observational astronomy as an area where small dollars could still fund real research. Looking through five years of the Astronomical Journal to find observational projects that I figured I could have done myself, I found some 30 possibilities. Of these, 28 were photometric observations of variable stars. Drawing the obvious conclusion, I quickly ordered a 10-inch Cass mirror set, a 1P21 photomultiplier tube, and one of the first Radio Shack TRS-80 microcomputers. Within a couple of months the telescope, photometer, and observatory were assembled, and observations were being reduced on the microcomputer. Out popped my first light curve. The problem with observational science was, I soon discovered, that it took several hours most every night out in the cold making boring, repetitive measurements. The fun part for me was studying the light curves, trying to discover what the stars were really doing. The answer, of course, was to have the microcomputer control the photometer, perhaps the telescope and, ideally, the entire observatory. This took some doing, but with some help from my friends the entire process was automated by 1983. Since then, I have designed or been involved with many robotic telescopes, including a couple of 1-meter telescopes. Looking back over 50 years of telescopes, I can now say that my first telescopeâ€”the Quaker Oats Scopeâ€”was my favorite. I can still remember the excitement when the neighborhood kids gathered around, we first pointed it at the moon, and, to our total astonishment, saw craters. Telescopes have always been special to meâ€”right up there with airplanes, rockets, and women. My first Quaker Oats Box telescope remains my favorite, as described last month, while my fifth telescope, the Fairborn-10, holds my record for productivityâ€”now having automatically made photometric measurements of variable stars every clear night from an Arizona mountaintop for over two decades. 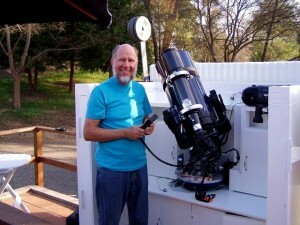 Nonetheless, I am now faithfully devoted to my current telescope, a Meade classic LX-200 equipped with a Santa Barbara Instruments Group ST7 CCD camera, a high-precision CNS Systems clock, and a Dell computer with a Maxtor 200 gigabyte external hard drive. 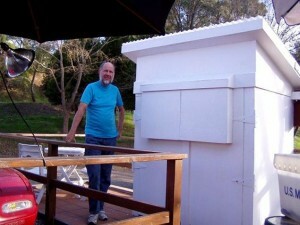 This observational system, the Orion Observatory (OO), is housed in a small tilt-off-roof enclosure that looks like a small â€œtwo-holerâ€ outhouse when the roof is closed. Appearances notwithstanding, â€œOOâ€ does not stand for the Outhouse Observatory, thank you very much. Located just one mile from Santa Margarita Lake and some 20 miles inland from the costal ocean fogs, the Orion Observatory is blessed with clear skies most every night between April and November. As the first stars come out, I tilt off the roof and power up the equipment. The Sky moves my telescope to the nightâ€™s eclipsing binary, and I use CCD Soft to place the system in autoguide. Without another astronomical thought, I move on to other things. All this takes less than five minutes. Throughout the evening and night, the systemâ€”tracking a binaryâ€”automatically takes hundreds of one-minute CCD camera exposures, about 700 megabytes worth of data by morning when the system shuts itself off on reaching a western limit switch. It thus avoids an embarrassing cable wrap-up should I sleep in. Before breakfast I take all of two minutes to power the system down, shut the doors, and close the roof. The real work, being done with Tom Smith at the Dark Ridge Observatory where similar observations are being made, is the reduction and analysis of our voluminous data. We are both observing short-period W UMa-type eclipsing binaries. With rotational periods of only six hours or so, we are able to obtain complete light curves every night. These are being analyzed for changes in shape due to migrating star spots, and for small changes in eclipse timings caused by mass exchange between the two stars or, if periodic, due to a Jupiter-sized planet in orbit around the binary. Although over fifty years have now passed since my first telescope, Iâ€™ve never lost interest in what, with a bit of persistence and work, these captivating instruments can reveal about the universe we live in.